100 gloves per dispenser box, 10 boxes per case. 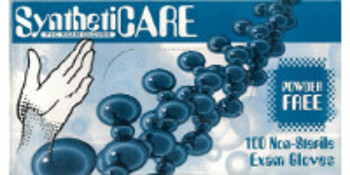 Syntheticare powder-free vinyl exam gloves are ideal for any type of medical or general use. The non-latex formula makes these gloves ideal for those who may be allergic to latex. Manufactured to ASTM and FDA standards as a medical device, these soft vinyl gloves are comfortable and have beaded cuff for extra strength and tear resistance.